UPDATE 1/6/14: Added some brief videos so you can get a feel of what the concert is like. I didn't get a chance to film samples of all of them but I still was able to capture at least brief clips from most. They're not great quality since I had to be a bit sneaky about it (with my little point and shoot camera) but at least you'll get a taste of what it was all about! UPDATE 11/08/14: A Monsters University portion has been added to the concert! Unfortunately, the concert I went to hadn't included that yet, but you can watch it on YouTube HERE. Yesterday, my wife Brita and I had the amazing opportunity to head down to Salt Lake City, UT to see Pixar in Concert performed by the Utah Symphony Orchestra! It was so amazing and, as you can expect from Pixar, a very classy, quality event. The song choices were perfect and just about every song I hoped they would perform was played. For those who aren't aware of what Pixar in Concert is, it's a live musical performance which includes medleys of all the most memorable music moments from every Pixar film. 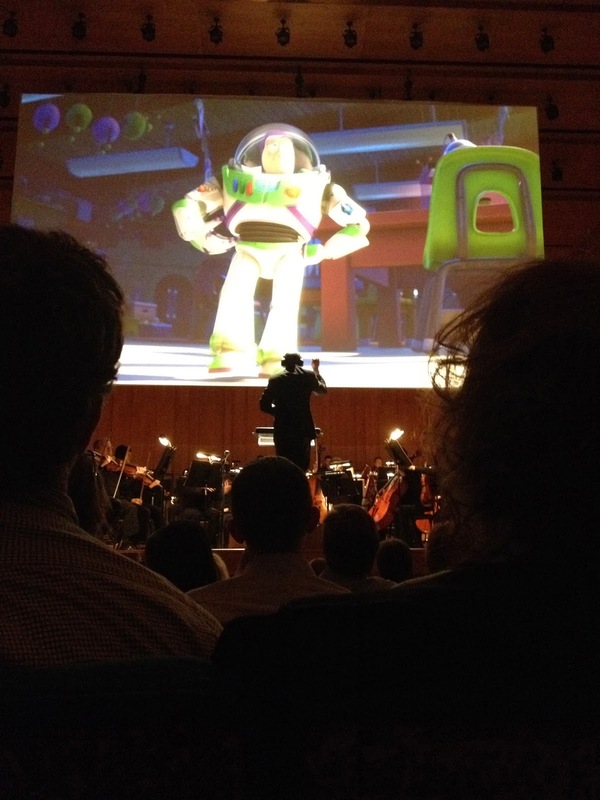 From Toy Story through Brave, the music played by a full orchestra while key scenes from the corresponding film played up on a massive screen. 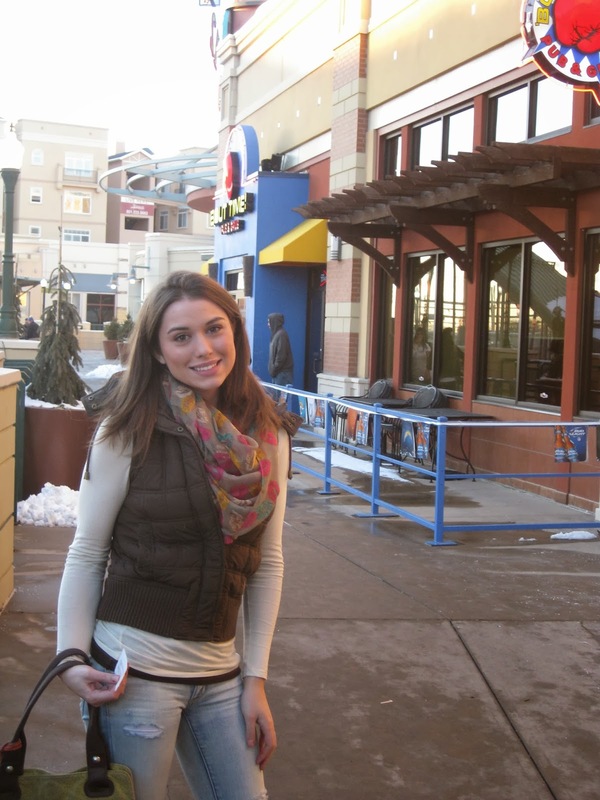 Since Salt Lake is about a three and a half hour drive from us, we decided to make a day of it. 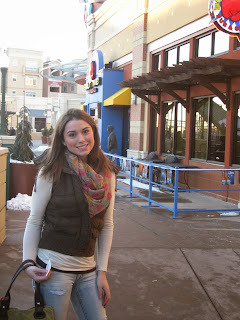 We left in the early afternoon so we could have a nice dinner at Tucanos Brazilian Steakhouse before the show. After going to a few more places and trying to find parking, we finally made it to the concert hall! We made it just in time to get settled and take a few pics. My parents outdid themselves with the seats they got us! Row seven, front and center. The place was packed...it was a full house for sure! 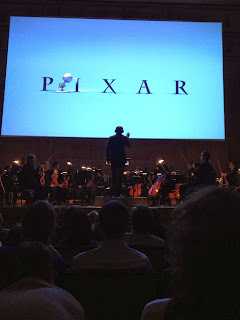 First (of course) they played songs from Toy Story starting with the classic introduction (the one heard at the beginning of the film when the Disney castle appears). It then went into a medley of many different songs including segments of "Buzz", "Sid" (Pizza Planet/The Claw), "Hang Together" (Sid's house escape), etc...it ended with a bang with the music from the classic finale when Buzz soars with Woody (called "Infinity and Beyond" on the soundtrack). It was especially epic hearing that one live! 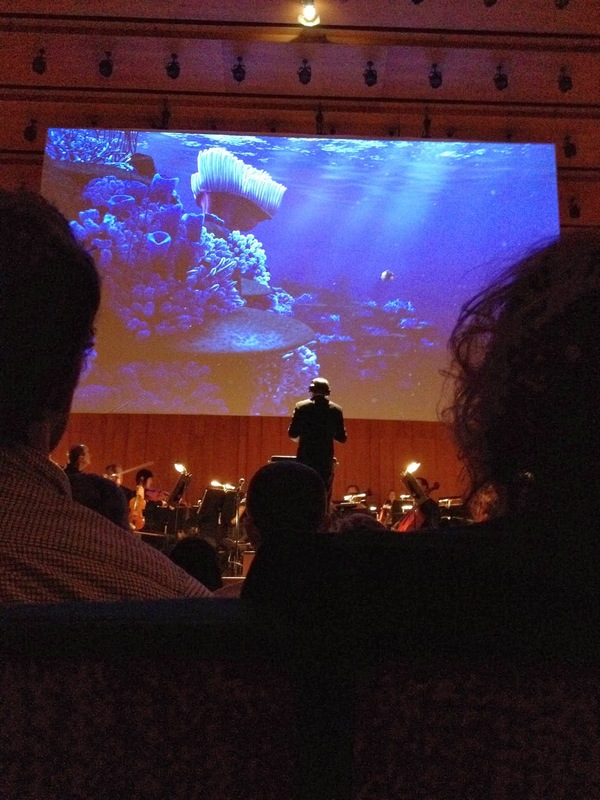 The next film represented was Finding Nemo. It was beautiful. They played a medley including the emotional "Nemo egg main title theme", "Field Trip", etc...the segment ended with "Swim Down" and a reprise of the Nemo theme. 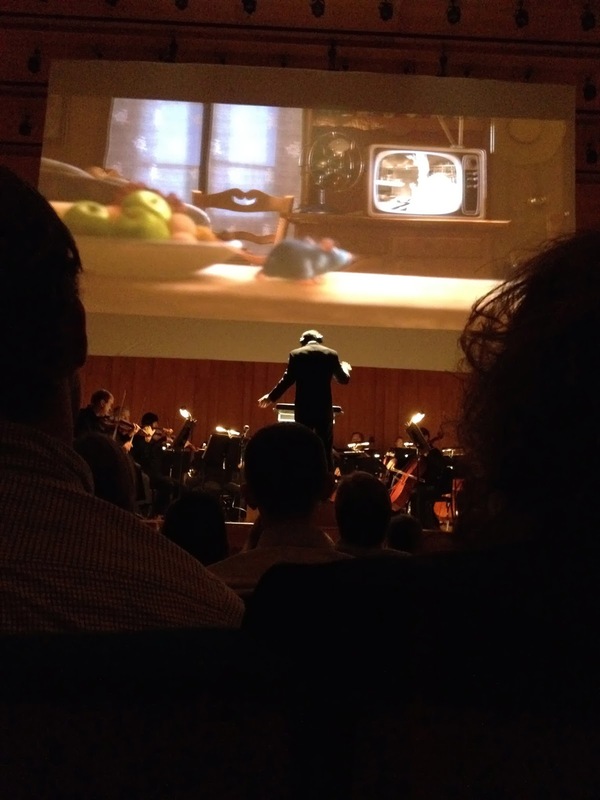 The Ratatouille medley was fantastic (as they all were). This was Brita's favorite. The songs performed were basically all the main themes you hear in the film. For those familiar with the soundtrack, the main cues played were "Wall Rat", "Souped Up", "Dinner Rush" and "Anyone Can Cook." And then we had some great cues from the classic A Bug's Life score played including some of the "A Bug's Life Suite", "The Flik Machine", "The City", "Circus Bugs" and "Victory." Next was Wall-E. Beautiful! For whatever reason, I didn't take a shot of the screen while it was being played. I guess I was just too entranced! 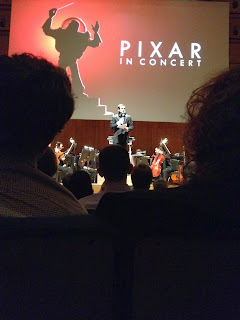 They played many of the songs from the soundtrack I had hoped for including "Wall-E", "The Axiom", "Define Dancing" and more. 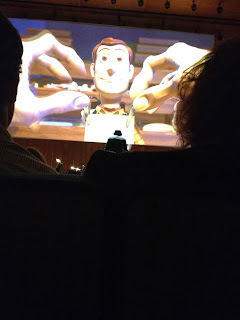 The Toy Story 2 segment was outstanding. From the soundtrack they started with "Zurg's Planet" (which I was hoping for) and then went onto others such as "Jessie and the Roundup Gang", "The Cleaner" and more. 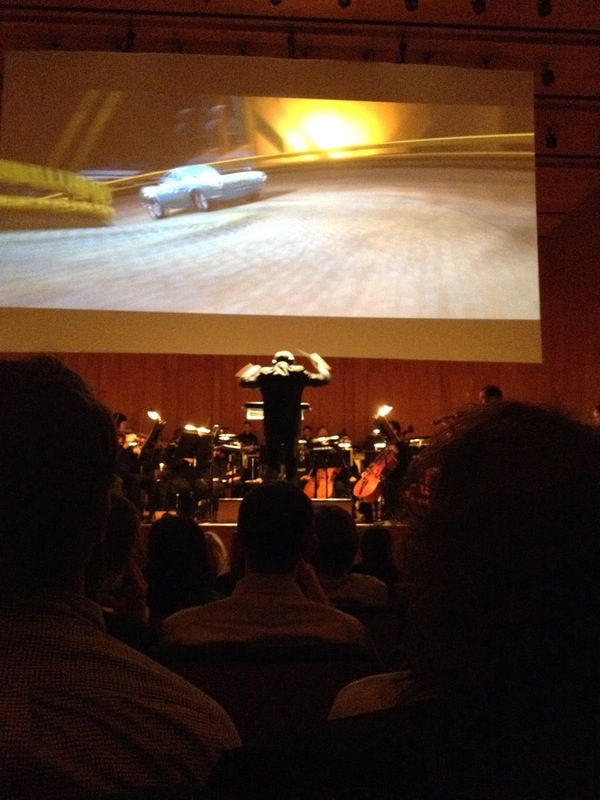 The two main songs from the Cars soundtrack played were "Mcqueen and Sally" and "The Big Race" from what I remember. There was maybe one more. The choices were great though! Those are my two favorite tracks in the soundtrack so I was happy. 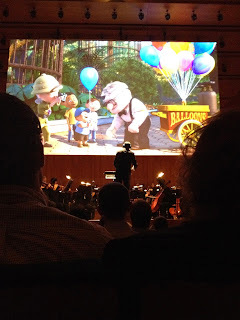 And the there was the ever so emotional, brilliant songs from Up. You can guess what songs were played... that's right, "Married Life" and "Carl Goes Up" (and a little from "The Ellie Badge'). This was, I believe, the longest medley of them all played during the evening but every second was just fantastic. Definitely one of my favorites! We then had a short ten minute intermission and then got right back into the action with The Incredibles! 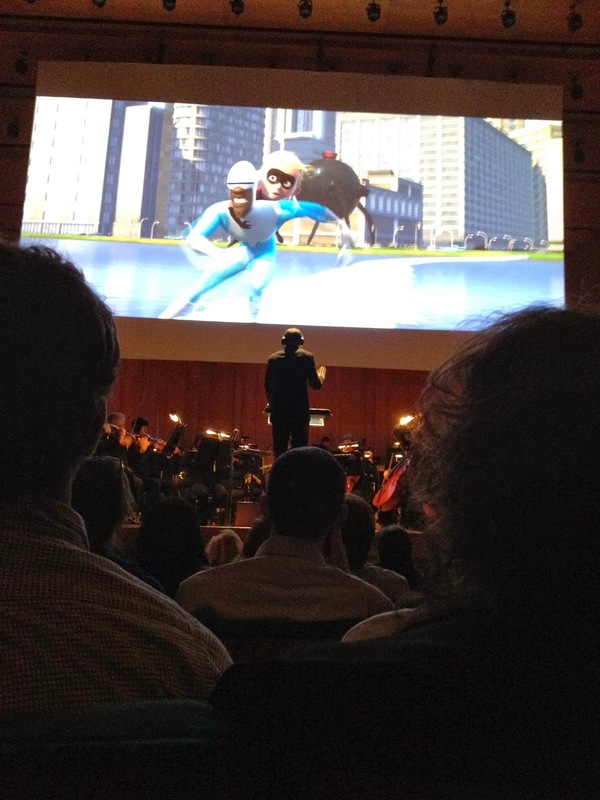 The main suite/theme was of course played along with some of the "100 mile Dash" and "Life's Incredible Again." I'm pretty sure they then did a reprise of the main theme to end with. It was incredible! 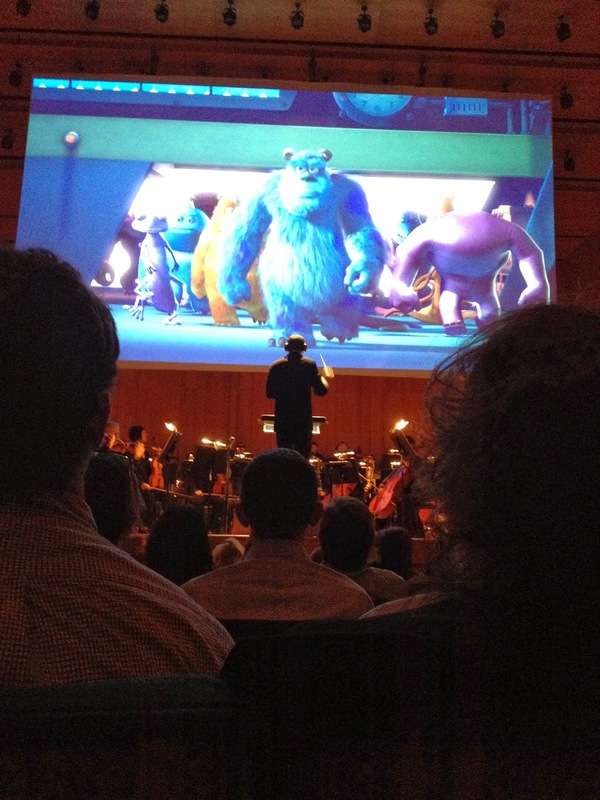 The score Monsters Inc. has got to be one of my top favorites so I was especially excited about this one. They played the classic "The Scare Floor" as well as "Enter the Heroes", "Ride of the doors" and a mixture of "Boo's going Home" and "Kitty." Hearing Boo's theme start playing on the solo piano was absolutely beautiful...that theme hits me with the chills every time and I feel it's one of Randy Newman's best emotional cues. The only thing I was missing here was I wish they played the opening titles (called "Monsters Inc." on the soundtrack) song but either way I loved this segment. 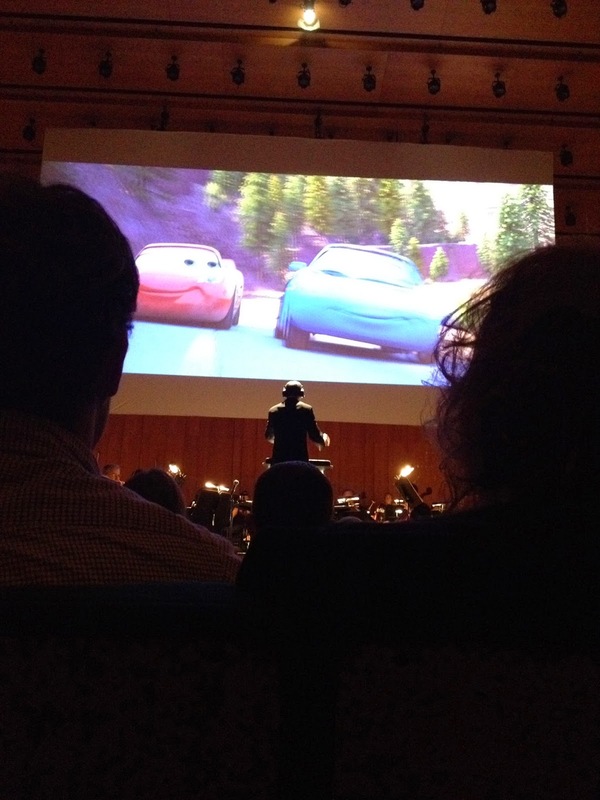 The Cars 2 portion of the night was action packed! I loved hearing the song "It's Finn Mcmissile" (the oil rig), which has always been one of my very favorites of the soundtrack. It was super cool hearing the electric guitar come in for this one and I love the espionage style. They also played the song (not found on the Cars 2 soundtrack) from when Mcqueen and his pit crew visit Mama and Uncle Topolino in Italy. They finished it off with the "Porta Corsa" theme and the exiting "The Turbomater." Then there was Brave which was also done flawlessly. The Brave soundtrack is beautiful and one of the film's greatest strengths. 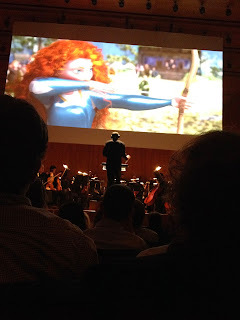 The songs played was quite the mixture of many different tracks from the soundtrack but I know there was some (the main parts) of "Fate and Destiny", "The Games", "Through the Castle", "Legends are Lessons", "We've Both Changed" (the bear battle part), and ended with some of "Merida's Home." 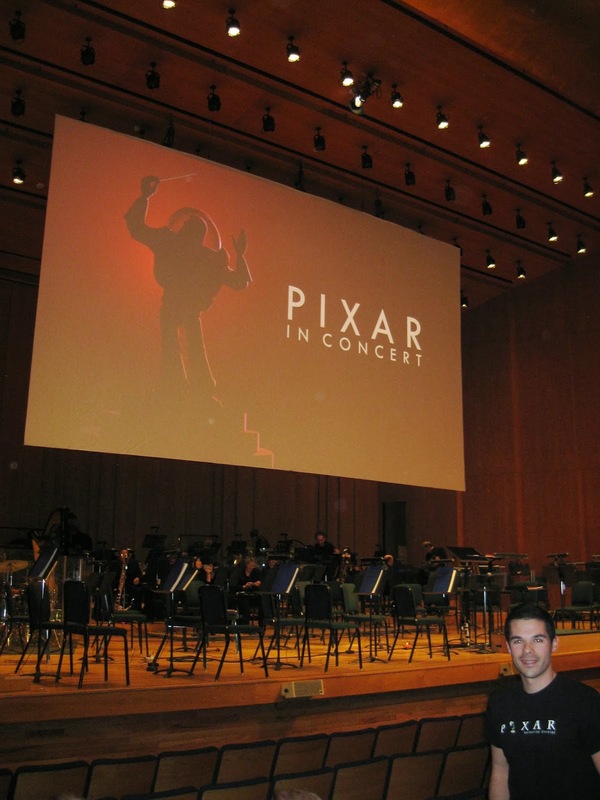 The last film represented was Toy Story 3 which was the perfect way to end since the concert started with the first Toy Story. This segment started with "Sunnyside" and went through parts of a few more main tracks from the score including "You Got Lucky", "Spanish Buzz", "To the Dump", "The Claw" and ended with a small portion of "Going Home" mixed with "So Long." It was gorgeous. All good things must come to an end...I wish it had gone on for even longer though! It was such a special night and an amazing opportunity. At the end (as seen in the pictures below), the night's conductor and all the musicians were able to stand and take a bow. 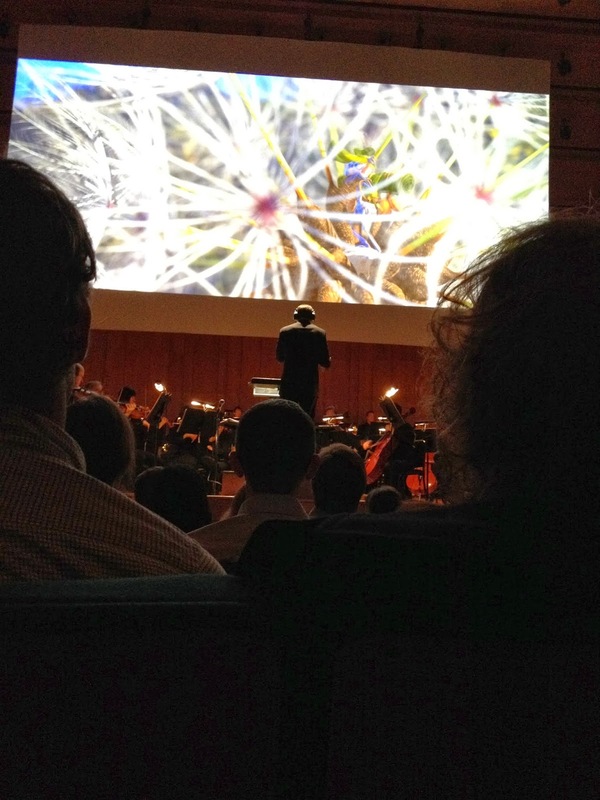 The audience gave them a well deserved standing ovation for a specular evening. I then leaned over to Brita and said "I hope we get an encore!" and sure enough that's what we got. 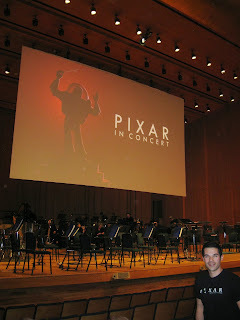 The orchestra then played an awesome rendition of "You've got a Friend in Me" while showing clips from all the Pixar films combined while giving tribute to the 4 amazing Pixar composers who made this all possible- Randy Newman, Michael Giacchino, Thomas Newman and Patrck Doyle. The signature and iconic Pixar logo (seen below) finished things off as the lamp hopped across the screen. The whole encore was the absolute perfect way to end! If you have a chance, I can't recommend this event enough! Every medley was so well done and well played. 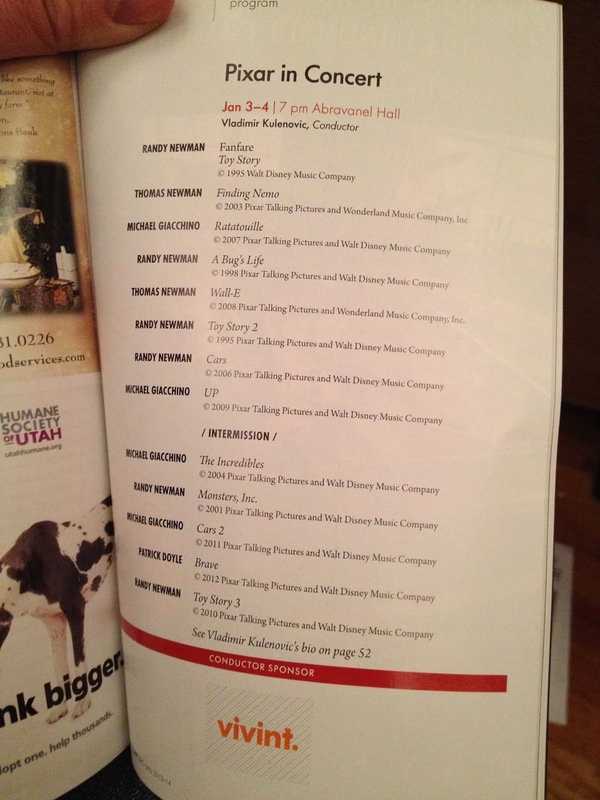 It sound as if you popped in the soundtracks right there and played them over the speakers. That's how spot on they were. 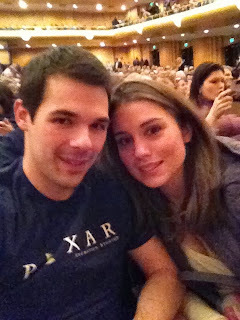 Last note, unfortunately there was no exclusive Pixar in Concert merchandise which I was totally hoping for! I really wanted a shirt, hat, mug or something to bring home from the event but even without those things, I will never forget it. 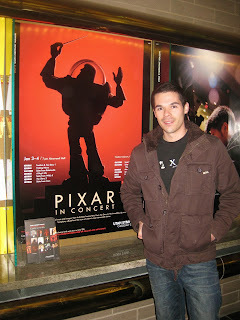 If you have seen Pixar in Concert, comment about it here! What was your favorite segment? Favorite song? I would love to hear about your experience. Awesome! My husband and I are hoping to attend this concert in SF this July...glad to hear you gave it such a good review! I loved reading your description of the concert! I had the great pleasure of seeing it in San Francisco last week and it was unbelievable. In my obsessive nature, I am attempting to make edits from the soundtracks of every suite as they were performed. I am using youtube clips and my own notes and your blog has been a great help in confirming what I've got. Sadly, even though they played Monsters University, there's no footage of that anywhere that I can find and I don't have the soundtrack so it's gonna be a gaping hole in my efforts. So far I've got 6 of the suites virtually done. Anyway, just thought I'd let you know that I enjoyed reading your experience!